“From this we can safely conclude two things. First, Christianity is certainly not the “hateful, hateful” religion Hicks says it is. A reasonable, fact-based view shows it’s reasonable to think that, in Sue Bohlin’s words, Christianity is ‘the best thing that ever happened to women.’ You might disagree with that, but are you taking all the facts into account? “Second, Hicks jumped to an unreasonable conclusion — and he’s trying to sell that conclusion — based on a self-serving, biased, misleading, and ridiculously small sample of the relevant evidence. You’re free to disagree with that too, but if you do, you’re making the same mistake atheism makes over and over again. I am not much impressed with Gilson’s case. He provides a long, involved argument for why we should not take the holy Bible at its word. Over and over it seems we find Christians telling us in one breath that the Bible is the Word of God, or at least words inspired by god, and in the next they tell us that it really doesn’t matter that much what it says. He claims that sort of extreme misogyny – “women shall be silent and submissive” – should be expected of a document written in those days by those primitive men. So isn’t he admitting that those are not the words of god, or even inspired by a god, and we shouldn’t accept them as indicative of sound moral guidance? But isn’t that exactly Mr. Hicks’ point all along - that you can’t just pick up the Bible and expect to get an enlightened moral message; that you’ll also find hateful stuff that has no place in a modern society, and that the Bible is not the place to go looking for enlightened moral instruction? And isn’t he right? If Christianity has been so good for women, as the author claims, then why doesn’t the Bible – the Christians’ founding document and rule book for morality – consistently support this argument? 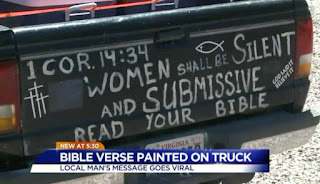 A woman’s testimony is worth half that of a man, a female slave is worth half that of a male slave, a woman is twice as dirty if she gives birth to a baby girl, and kill everyone else but keep the virgins for yourselves; the Bible is full of this disgusting, myopic stuff, yet this man thinks we should ignore all these crystal clear words from scripture and just accept Christianity as a moral beacon for the world – on his word. If the Bible is really god’s prescription for humanity, as the Christians claim, then isn’t he the one who is avoiding the facts that matter? And, as for Jesus’ “enlightened” approach, notice that the author never mentions the Canaanite woman who pleads with Jesus to cure her daughter (Matt. 15:21-28) and gets compared to a dog begging for scraps. And why were there no female disciples? Was it just the times, as suggested by the author? Well wasn’t it Jesus’ purpose to right the wrongs of that age, such as not involving women in anything important? By not including women among the disciples, wasn’t Jesus sending the signal that it’s perfectly respectable to deny women positions of respect? In the final analysis, if the Bible was really a book of enlightened moral instruction for mankind, that would be obvious to all, and wouldn’t need to be defended. In providing this defense, the author of this article is proving Mr. Hicks was right all along.